For other uses, see Scottish Premiership (disambiguation). Teams receive three points for a win and one point for a draw. No points are awarded for a loss. Teams are ranked by total points, then goal difference, and then goals scored. At the end of each season, the club with the most points is crowned league champion. If the points, goal difference and goals scored between teams are equal, a playoff game held at a neutral venue shall be played to determine the final placings. The play-off will only occur when the position of the teams affects the outcome of the title, European qualification or relegation and shall not occur otherwise. The top flight of Scottish football has contained 12 clubs since the 2000–01 season, the longest period without change in the history of the Scottish football league system. During this period the Scottish Premier League, and now the Scottish Premiership, has operated a "split" format. This is used to prevent the need for a 44-game schedule, based on playing each other four times. That format was used in the Scottish Premier Division in the mid-1980s and early 1990s, but is now considered to be too high a number of games in a league season. A season, which runs from August until May, is divided into two phases. During the first phase, each club plays three games against every other team, either once at home and twice away or vice versa. After this first phase of matches, by which time all clubs have played 33 games, the league splits into two halves - a 'top six' section and a 'bottom six' section. Each club proceeds to play a further five matches, one against each of the other five teams in their own section. Points achieved during the first phase of 33 matches are carried forward to the second phase, but the teams compete only within their own sections during the second phase. After the first phase is completed, clubs cannot move out of their own half in the league, even if they achieve more or fewer points than a higher or lower ranked team, respectively. At the beginning of each season, the SPFL 'predicts' the likely positions of each club in order to produce a fixture schedule that ensures the best possible chance of all clubs playing each other twice at home and twice away. This is known as the league seeding and is based on clubs' performance in the previous season. If the clubs do not finish in the half where they are predicted to finish, then anomalies can be created in the fixture list. Clubs sometimes play another three times at home and once away (or vice versa), or a club can end up playing 20 home (or away) games in a season. The bottom placed Premiership club at the end of the season is relegated, and swaps places with the winner of the Scottish Championship, provided that the winner satisfies Premiership entry criteria. With the creation of the SPFL, promotion and relegation play-offs involving the top flight were introduced for the first time in seventeen years. The Premiership club in eleventh place plays the Championship play-off winners over two legs, with the winner earning the right to play in the Scottish Premiership the following season. This enables two clubs to be relegated from the Premiership each season, with two being promoted. Prior to the creation of the Scottish Premiership, only a single club could be relegated each season - with only the second tier champions being promoted. The Scottish Football League had used playoffs amongst its three divisions since 2007. UEFA grants European places to the Scottish Football Association, determined by the Scotland's position in the UEFA coefficients ranking system. The Scottish Football Association in turn allocate a number of these European places to final Scottish Premiership positions. At the end of the 2016–17 season, Scotland was ranked 23rd in Europe – granting them a single side in the UEFA Champions League and three sides in the UEFA Europa League. From the 2018-19 season, the top placed team in the Scottish Premiership gains qualification to the Champions League first qualifying round, whilst the second and third placed teams enter the Europa League at the first qualifying round stage. An additional place in the Europa League second qualifying round is awarded to the winners of the Scottish Cup. Should the winners of that competition have already qualified for European competition, then the second qualifying round place is given to the second placed team in the league, with the third and fourth placed teams entering the first qualifying round. The 2017 'Global Sports Salaries Survey' report found a large variation between the wages offered by teams in the Scottish Premiership, with champions Celtic paying an average annual salary of £735,040, per player, whilst traditional rivals Rangers could only pay £329,600 and league runners-up Aberdeen offered £136,382. The lowest salary offered by any of the twelve member clubs was Hamilton's £41,488 – 17 times less than Celtic, whose wages were close to the sum of the other eleven clubs combined. The report stated that this disparity was the third-greatest from the 18 leagues surveyed, and that the Scottish Premiership offered the third-lowest salaries of those leagues; by contrast, Celtic's opponents in the Champions League that year paid average wages of £6.5m (Paris Saint-Germain) and £5.2m (Bayern Munich), seven times higher than the Scottish club. The clubs listed below have competed in the Scottish Premiership since it was formed in 2013. Clubs currently playing in the league are shown in bold. As of 2018, Scotland's top-flight league championship has been won 54 times by Rangers and 49 times by Celtic. Nine other clubs have won the remaining 19 championships, with three clubs tied for third place with 4 apiece. The last time the championship was won by a club other than Rangers or Celtic was in 1984–85, by Aberdeen. 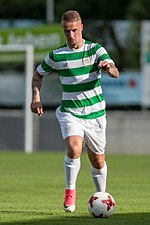 Scotland international Leigh Griffiths is the top goalscorer in the Scottish Premiership era with 73 goals, all for Celtic, followed by Aberdeen's Adam Rooney with 66. Kris Doolan and Kris Boyd are the only other players to reach 50 goals since the establishment of the Scottish Premiership. ^ a b The Scottish Premiership has only existed since 2013. For a complete record of clubs that have won Scottish league championships, see list of Scottish football champions. ^ Clubs only include those where players scored goals in the Scottish Premiership. ^ a b c d e f g h Player also scored goal(s) in the Scottish Premier League. ^ "SPFL names Ladbrokes as sponsor in £4m deal". BBC News. 13 May 2015. Retrieved 13 May 2015. ^ "SPFL: New Scottish league brands unveiled". BBC Sport. BBC. 24 July 2013. Retrieved 24 July 2013. ^ "The Rules and Regulations of the Scottish Professional Football League" (PDF). Scottish Professional Football League. 1 December 2015. pp. 36–7. Retrieved 3 February 2016. ^ a b Anderson, Craig (24 July 2013). "The Scottish Premiership 2013/14 in numbers". The Scotsman. Johnston Publishing. Retrieved 11 December 2013. ^ a b Grant, Michael (8 August 1999). "SPL stand by their split decision". Sunday Herald. Herald & Times Group. Archived from the original on 10 June 2014. Retrieved 11 December 2013. ^ "SPFL: Announcement on last round of fixtures delayed until after weekend". BBC Sport. 4 April 2018. Retrieved 6 April 2018. ^ "Scottish Premiership post-split: Ross County play extra away games". BBC Sport. BBC. 13 April 2017. Retrieved 6 April 2018. ^ McLaughlin, Chris (28 June 2013). "The new Scottish Professional Football League survives hitch". BBC Sport. BBC. Retrieved 11 December 2013. ^ McGuiness, Nathan. "The Scottish Professional Football League". Retrieved 6 April 2014. ^ Campbell, Andy (30 April 2013). "Scottish Premier League considers play-off introduction". BBC Sport. BBC. Retrieved 11 December 2013. ^ "Champions League and Europa League changes next season". UEFA.com. Union of European Football Associations. 27 February 2018. Retrieved 12 March 2018. ^ Kassies, Bert (4 March 2018). "Qualification for European Cup Football 2018/2019". kassiesA. Retrieved 12 March 2018. ^ "Aberdeen, Hearts & Hibernian discover Europa League opponents". BBC Sport. 20 June 2016. Retrieved 12 March 2018. ^ a b c "Celtic: PSG average salary almost nine times that of Scottish champions". BBC Sport. 27 November 2017. Retrieved 27 November 2017. ^ "Hamilton Academical Football Club". Scottish Professional Football League. Retrieved 11 November 2013. ^ "Heart of Midlothian Football Club". Scottish Professional Football League. Retrieved 11 November 2013. ^ "Hibernian Football Club". Scottish Professional Football League. Retrieved 29 May 2017. ^ "Livingston Football Club". Scottish Professional Football League. Retrieved 20 May 2018. ^ "St Johnstone Football Club". Scottish Professional Football League. Retrieved 11 November 2013. ^ "St Mirren Football Club". Scottish Professional Football League. Retrieved 20 May 2018. ^ "Celtic 8–1 Hamilton". BBC Sport. BBC. 19 January 2016. Retrieved 20 January 2016. ^ a b c d Campbell, Andy (21 May 2017). "Celtic 2–0 Heart of Midlothian". BBC Sport. BBC. Retrieved 21 May 2017. ^ "BBC". BBC Sport. Retrieved 4 March 2017. ^ Idessane, Kheredine (14 June 2018). "Odsonne Edouard: Celtic agree club record fee for PSG striker". BBC Sport. BBC. Retrieved 16 July 2018. ^ "Moussa Dembele: Celtic striker joins Lyon in £19.7m move". BBC Sport. 31 August 2018. Retrieved 31 August 2018. ^ "Celtic's Moussa Dembele joins Lyon for Scottish record fee". Befast Telegraph. 31 August 2018. Retrieved 3 September 2018. ^ MacArthur, Scott (13 May 2017). "Young guns: Dean Campbell becomes Aberdeen's youngest ever player after cameo against Celtic". The Scottish Sun. News Group. Retrieved 29 September 2017. ^ English, Tom (15 May 2016). "Celtic 7–0 Motherwell". BBC Sport. BBC. Retrieved 16 May 2016.